Taco Bell giveth, and Taco Bell taketh away. But there is hope: Just as we've ended our mourning for the Grilled Stuft Nacho,T-Bell is unleashing a Frankenfood that was once only spoken of in whispers. 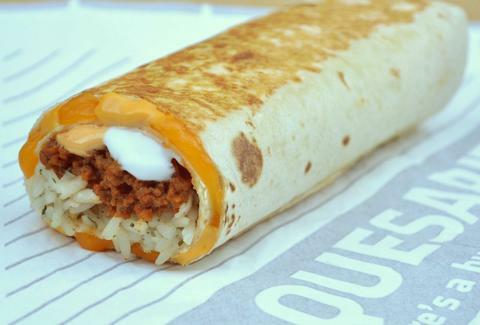 Beginning Monday, June 9, you can order the long-awaited Quesarito, which is exactly what it sounds like: a burrito wrapped in a quesadilla. Of course, some people are already calling Taco Bell out for cribbing Chipotle's secret menu moves, but those people are also complaining about there being more Quesaritos in the world. Don't be like them. They probably hate on kittens, too. Kristin Hunt is a food/drink staff writer for Thrillist. She's never had a Quesarito, because she still hasn't found the courage to ask for one at Chipotle. Follow her at @kristin_hunt.